Having a pet is something that every child wants, mainly because they are fun to play with and fun to watch too. They give your kids some companionship and a good friend. Pets are fun for adults and for kids as well. They are relaxing, they can be your friend, and they help to teach responsibility. The thing with kids is that they usually aren’t the best at keeping commitments, and they certainly don’t know all that much about taking care of another living being. For this reason you will want to get them a pet that is low maintenance, but is still fun too. Here we have 4 great pets for your kids, all of which are low maintenance, but really fun none the less. Now right off the bat, you can replace the word hamster (more on hamsters here) with mouse or rat or other such pet rodent that you deem appropriate. Many children love little rodents because they are so energetic, and watching them run around on that little wheel is definitely a hoot. Hamsters, mice, and other rodents require barely any maintenance, which is definitely a big bonus. All they really need is a cage*, bedding, a toy or two, an exercise wheel, and food dishes. Animals like a hamster only require weekly cage cleanings where you need to change the bedding and clean out their waste. Other than that, a hamster doesn’t really need any attention. Sure, they will appreciate it if your kids play with them, which they obviously will, but as far as maintenance goes, there is really not all that much needed. Your kids will love taking the hamster out of its cage, holding it, cuddling it, and watching it run around the home! As far as maintenance goes, it really does not get any easier than with a hamster, mouse, rat, or other pet rodent. Another pet that might be a good idea for your kids is a cat. Cats have minds of their own sometimes, which is actually a good thing because it means that they don’t require all that much maintenance or attention. Sure, you might have to bring it to the vet at first to get some immunizations, but other than that, they really don’t require very much effort to keep healthy and happy. All they really need is regular feeding to stay healthy. If you have an indoor cat, you will need to clean their litter box*, but that is not very hard or time consuming. This litter box problem is also eliminated when you have an outdoor cat, something that is recommended. Just keep in mind, while outdoor cats are generally easier to care for because of the lack of a litter box, they won’t be around the home as much to provide your kids with companionship. However, cats do love to get their exercise, which your kids can provide them with by playing with them. It really does not take much more than a string or a little ball to keep a cat occupied. 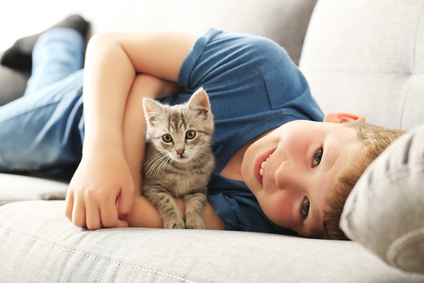 The fact of the matter is that a cat is cuddly, they like attention, they like to play, and their antics can be really fun for your kids to watch. Besides feeding, a trip or two to the vet, and some regular cleaning, a cat can more or less look after itself. 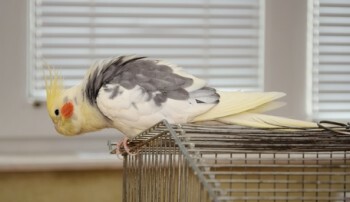 A small bird like a love bird is another great low maintenance pet idea for your kids. A bird may sound like it would require a lot of effort to take care of, but that is really not the case at all. As long as you have a nice cage, some bedding, and food, there is nothing else that is necessary to keep a small bird healthy and happy. Sure, you might need to take it to the vet when it gets sick, but that is true for every pet that you might bring into your home. The only maintenance that you really need to think about when it comes to a bird is whether or not you want to clip its wings. A bird with unclipped wings will provide your kids with a lot of fun and entertainment because they can fly around the home. On the other hand, they might defecate around the home or even fly away if given the chance. This is something you will need to consider. Some people do consider it cruel to clip a bird’s wings, yet another consideration you need to think about. The bottom line is that birds really only need some food and water, plus a good little home to live in. They are fun and fairly easy to care for as well. Betta fish really are fantastic creatures, and as far as maintenance goes, when compared to other fish and pets, there is barely any of it. You will need a Betta fish tank, a small filter, some rocks or substrate, a plant or two and even a protein skimmer. 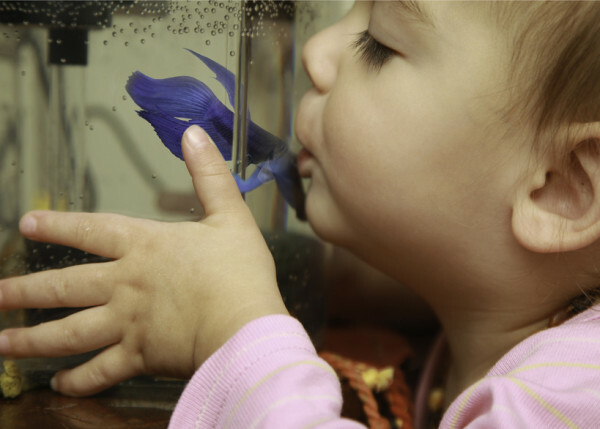 Other than that, there is nothing you need to take care of a Betta fish, except of course for the food. Besides feeding the Betta fish and cleaning the tank about once per week, there is no maintenance involved. It is so simple that your kids can probably do it on their own, and if they can’t, well at least it is not all that much work for you. They are fun little creatures to have because watching them swim around is quite entertaining. Plus, they add a next level of beauty and elegance to any room. There is also the fact that a little Betta fish tank can act as a creative stimulant, while also being a relaxing agent, and even a sleep aid too. Whatever low maintenance pet that you get for your kids, they will definitely love it. A pet is a great way to teach your kids some responsibility while letting them enjoy a new friend at the same time. Just keep in mind that each pet has its own specific requirements and you will be just fine. You might also like our post on the cheapest family pets. Yep, you certainly don’t want to get them dogs. Not low maintenance at all.